Your company brochure/materials displayed at the registration table. All of the above may be customized to your preferences—please contact Chapter Administrator for details. All sponsorship benefits will be honored from the date of commitment. **Projector usage may not be available at every event. 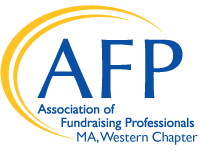 AFP Western Massachusetts is a chapter the Association of Fundraising Professional, a nonprofit o 501(c)(3) organization.